The Comoros Islands had been a French colony until July of 1975, when they gained their independence. The islands are a poorly developed agricultural economy that relies heavily on foreign grants to sustain roughly 550,000 people. There is little industry and little natural resources. The terrain is mountainous, with only 750 km (450 miles) of roads, 540 km (324 miles) of which is gravel. 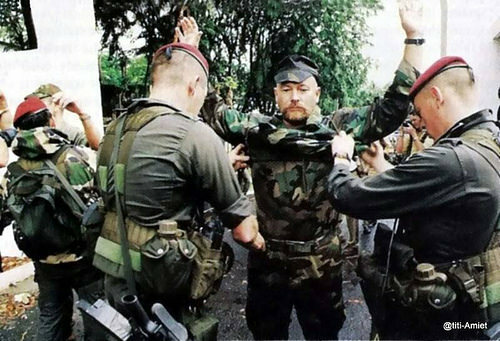 On September 28, 1995 Bob Denard and 33 mercenaries took control of the Comoros islands in a coup (named operation Kaskari by the mercenaries) against President Djohar. Despite having received advanced notice and hints about the coup, France did nothing until the day of the invasion; when they severely denounced it. President Jacques Chirac requested that the Minister of Defense and the Army Chief of Staff begin drafting plans for the retaking of the Comoros Islands. Intelligence was gathered and COS (the French special operations command) assets were placed on alert. Teams from GIGN, DRM, and DGSE began discreetly deploying to the area around the Indian Ocean. On October 3 the French government gave Operation Azalee the green light. Bob Denard began to create a civilian government in an effort to stave off the impending invasion. A new presidential guard was created from loyal members of the old guard that Denard himself had trained. Strategic Strong points armed with heavy machine guns were set up around the island, particularly around the islands two airports. By this time, more than 200 members of COS and DRM were on their way to the islands aboard a frigate and two patrol boats. Members of GIGN and Commandos Jaubert as well as several Puma squadrons were also in the area. The French ultimately deployed 600 men against a force of 33 mercenaries and a 300 man dissident force. The operation started off at 11 PM on October 3rd when members of Commandos Jaubert explored the beaches near the island’s two airports at Hahaya and Iconi. At 2:30 AM three Pumas delivered members of 1erRPIMa, 13eRDP to the tarmac of the Hahaya airport. Initially taken under fire from the insurrectionist’s heavy machine guns, the French troopers use their night vision gear and the cover of darkness to secure the airport and local area. 20 Comoran soldiers are captured in the process. By 3:00 AM members of Commandos Jaubert had secured the Iconi airport. Elements of 5eRIAOM, 2eRAMa and, 2eRPIMaare flown in on C-160 Transals to hold the airfield while Commandos Jaubert heads for the Kandani barracks. 30 Comoran soldiers are captured in the process. 15 members of GIGN are then flown in and liberate the French Embassy in Moroni. Another team of Jaubert commandos assault and seize the Vulcain; the ship used by Denard and his mercenaries to reach Comoros. The main air assault begins at 5 AM, when two Transalls deliver elements of the Foreign Legion to the runway at Hahaya. 30 minutes later they are joined by members of 2ea, RIAOM Marines, and 2e RAMa artillery. By 5:50 the airport is secure and a security zone has been established around it. Supplies start arriving by shuttle as French units begin moving towards the capital of Moroni. At 6:30 AM French units are racing to reach the barracks at Kandani before Bob Denard and his mercenaries break free. Another force races towards pass where a force of 200 insurgents has been reported. By 3:00 pm the next day Bob Denard and his Mercenaries had surrendered. After being frisked by GIGN gendarmes, he is taken to the Iconi airport, flown to France, and Jailed. While not a pure special operations action, the French re-taking of the Comoros Islands is of noteworthy status. Special operations units were successfully deployed and utilized in a timely manner. In seven days, plans were drawn up and roughly 1,000 soldiers were deployed to support this operation. Air assets were used to move soldiers around quickly and concisely. Once Denard realized that the French planned to retake Comoros the mercenaries were ordered not to fight. In addition the odds were very disproportional; some might say that this was not a “fair” fight. However, by presenting such overwhelming odds, the French made any resistance futile and thus prevented bloodshed. France acted decisively and used their special forces to move rapidly and achieve tactical surprise. Units such as GIGN and Commandos Jaubert were used to clear potentially dangerous buildings. Using the right combination of paratroopers and Special Forces teams, French units were able to retake the island in less than 48 hours. This entry was posted in France, Mercenaries by MSW. Bookmark the permalink.